This was a make-up-a-recipe-as-you-go kind of soup that turned out way way GOOD. I am a super chunky soup person. This chowder is just that. 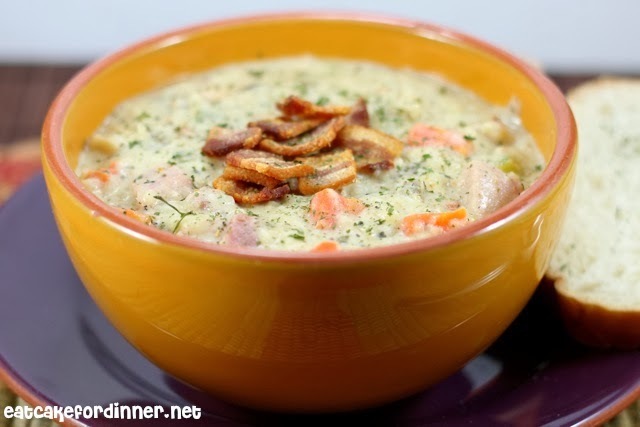 It's thick and creamy with lots of chunks of veggies, beans, ham and rice. I used bacon for two reasons. One, I really wanted to saute my veggies in bacon grease, because bacon grease means FLAVOR. Plus, garnishing a creamy soup with crispy bacon is always a plus. This tastes amazing day one and served as leftovers. *Wild Rice can be omitted and replaced with another can of Great Northern beans, if desired. Heat a large dutch-oven over medium heat. Add the diced bacon and cook until crisp; remove bacon to a paper-towel lined plate and reserve for a garnish. Remove all but two Tablespoons of bacon grease. Add the celery, carrots and onion and saute until vegetables are tender; about 10-15 minutes. Add the chicken bouillon powder, lemon pepper and Italian seasoning and stir together. Stir in the flour and cook for two minutes. Slowly add the water and use a wooden spoon to scrape up the brown bits on the bottom of the pan. Mixture should be very thick right now. Stir in the half-and-half, ham, beans and cooked wild rice. If mixture is still too thick for your liking, stir in more water. Taste and adjust seasonings, if needed. You can serve immediately, but I like to cover mine with a lid and simmer for about 45 minutes. The chowder will stick to the bottom of the pan, so make sure to stir it occasionally. Serve with crackers or sliced bread and garnish with cooked bacon. Makes 5-6 servings. Jenn's Notes: I used leftover holiday ham that I had in my freezer. Linked up at Weekend Potluck! and Strut Your Stuff Saturday! and Tip Me Tuesday! I love Uncle Ben's Wild Rice and it cooks in 5 minutes, but I understand your love for other wild rice. It's just like my friends that won't touch Minute Rice, but I can't tell a difference. I have used actual wild rice in a few recipes before and it takes forever to cook. You can always substitute your favorite wild rice in this recipe. Thanks for the link. This soup sounds delicious!! I love all of those ingredients together. I'm sure this makes for a cozy supper on these cold nights! It does warm you right up! Thanks, Leslie. This has comfort food written all over it! Perfect for these chilly winter evenings! Looks and sounds awesome to me! Thanks so much for sharing at Weekend Potluck! 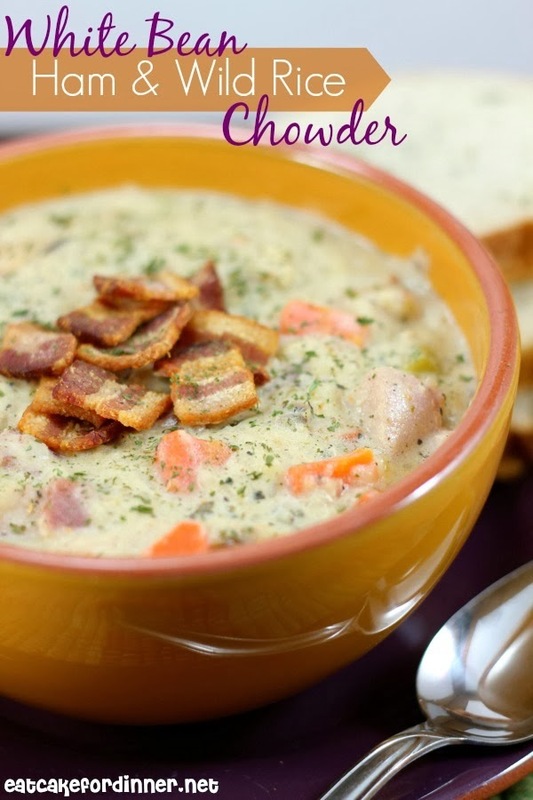 This chowder looks so hearty and scrumptious! Added it to my soup roundup for next week :) And pinned! I will definitely be making this! It fits the chunky, creamy, comfort food I love! Your substitutions sound delicious. I'll have to try it out with chicken too. I am so glad you liked it!